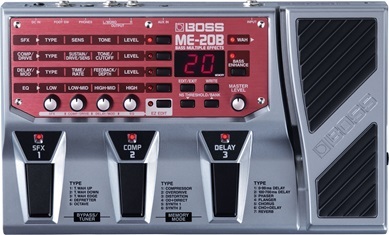 NOTE: The BOSS ME-20B has been discontinued. The Boss ME-20B bass multi-effects pedal is the latest installment in the ME range. Let me start off by saying that this pedal is designed to be used in a live performance setting. So if you are someone who plays in front of a crowd pretty often then you could benefit tremendously from owning a pedal like this one. I am sure many of you already aware of the fact that BOSS has released a separate ME-20 model that is designed for guitarists. You will be happy to know that the bass version of the ME-20 features the same performance-based design as the guitar version. The Boss ME-20B is very appealing to bassists who want a multi-effects pedal that is targeted towards playing live shows, which is made apparent by the amazingly solid construction of the pedal. There is no doubt in my mind that this pedal is built to last! One of the things I like the most about the ME-20B is that it is also incredibly affordable. As you all know, being a musician can be a very expensive hobby, so if I can save some money somewhere then I am going to take it! As you may have noticed from the images of the ME-20B, the pedal features 3 footswitches, 5 control knobs, and a built-in expression pedal. Creating a sound is incredibly easy. All you have to do is select the effect you’re after and then use the control knobs to tweak how it sounds. It is basically the same as using the standalone versions of these pedals. It is very obvious that BOSS have designed the ME-20B to be user-friendly, which is very important if you plan on using the pedal live, as I am sure most of you are planning on doing so! Another great thing about this pedal is that it features BASS ENHANCE functionality. This functionality adds an insane amount of presence to your tone and gives you an awesome ‘bass solo’ tone that you may or may not be familiar with using before. In addition to this, you can also activate the BASS ENHANCE effect using an optional pedal, which allows you to gain a huge presence boost at a moments notice. The BOSS ME-20B has another awesome feature known as EZ EDIT. This feature allows you to create whatever sound you want with an insane amount of ease. Using only one knob you will be able to adjust the parameters of any effect you select and save them to your pedal instantly. Once you have saved an effect you will be able to bring it out and use it whenever you need. In total, you can save up to 30 different sounds that you have created to the internal memory of the ME-20B. This will make sure you never lose any of those patches that you have worked so hard to create! If you are like me, then the last thing you would want is to spend a whole lot of time getting the perfect tone and then having it dissapear when the unit is turned off. It seems that BOSS have really thought of everything when it comes to their ME-20B. If you want to jam along to some of your favourite tunes while you’re practicing your instrument then you can easily plug your mp3 player or smartphone into the input jack located on the side of the pedal. In my opinion, this feature wasn’t completely necessary, but I will admit that it is still a cool feature to have. You can power the ME-20B using either an AC adaptor, or 6x AA batteries. This just shows you how portable the pedal really is. If you are someone who travels a lot, then you will find this feature very handy. Most people will probably just find themselves leaving the ME-20B plugged in, which is the best option to take if you don’t want to chug through a tonne of AA batteries. I am sure many of you are aware of how quickly pedals can chew through batteries (I know I am!). Let me start off by saying that I think that the BOSS ME-20B is an incredibly well-built pedal. It is definitely built for the harsh conditions of touring and playing live shows. What I love even more than the insane durability of the ME-20B is the wide range of different tones you can produce using this pedal. With room for up to 30 sounds, you will have no problem filling it full of amazing patches that you have gone out and created. I find it quite sad that BOSS have discontinued manufacturing this pedal, as I believe it still has a lot of potential. With that being said though, it probably isn’t the best idea to pick this pedal up if BOSS are not supporting this model anymore. Overall, if you are a bassist that needs a multi-effects pedal that can withstand the trauma associated with playing live, then this pedal could be a great option for you. Intermediate to advanced level bassists would benefit the most from a pedal like this. If this sounds like you, then I would have no problem recommending this pedal. Just keep in mind that this is a discontinued product if you are thinking of purchasing the pedal. In case you are interested in learning more about the BOSS ME-20B, you can check out the user manual of the product here. 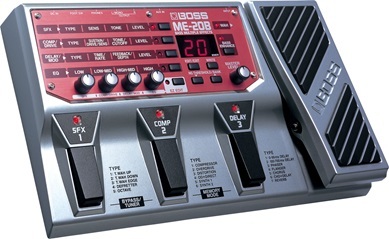 Thanks for checking out our BOSS ME-20B review!